Christine Sun, manager of eBook Dynasty, receives 2015 Victoria’s Multicultural Award for Excellence – Victorian Multicultural Marketing Award from Premier Daniel Andrews at Government House. 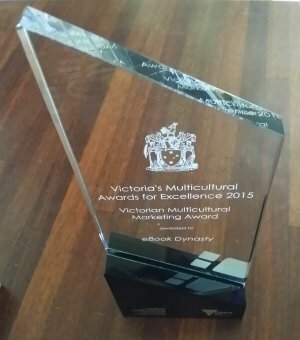 On December 3, 2015, eBook Dynasty was one of the recipients of Victoria’s Multicultural Awards for Excellence. A grand ceremony was held in Government House, where Governor of Victoria, the Honourable Linda Dessau AM, Premier Daniel Andrews, Minister of Multicultural Affairs Robin Scott and Victorian Multicultural Commission Chairperson Helen Kapalos joined together to recognise “the outstanding achievements of 75 recipients representing 23 nationalities and faiths who have demonstrated passion and commitment to serving our state’s multicultural community”. “Victoria has much to be proud of when it comes to multiculturalism. Collectively, we speak over 260 different languages and practice around 135 different faiths. We embrace different cultures from across the globe, and value the distinct contribution each culture makes to our broader community,” said Governor Dessau in a statement. Ms Kapalos said the dedicated recipients set an example for all Victorians to follow. “The Victorian Multicultural Commission thanks and congratulates all 2015 award recipients for their inspirational and tireless contributions. As the voice of Victoria’s culturally and linguistically diverse communities, we look to them as role models who champion and embrace cultural diversity,” she said. eBook Dynasty received Victorian Multicultural Business Awards – Victorian Multicultural Marketing Award, which recognises “a business that uses a multilingual workforce and innovative marketing and communication strategies to engage multicultural audiences and who use their brand or reputation to promote the benefits of cultural diversity”. Forthcoming: Statement of Support for eBook Dynasty, nominee, Victorian Multicultural Business Awards – Victorian Multicultural Marketing Award. Forthcoming: eBook Dynasty in dialogue with the Victorian Multicultural Commission.